Last week I was interviewed by the co-founder of the Dark Mountain project. Dougald Hine has been promoting creative reflection on the future of culture during the decay and ultimate collapse of this civilisation due to environmental degradation and climate chaos. Actually, I did enjoy it, as it was was the first time I’ve been asked to make sense of my own reaction to a realisation of that probable collapse. Ahead of the interview, I started to write down ideas for my own sense making. I dont keep a diary, and so this was a useful moment of reflection. It is what some of my postgraduate students do as part of a method called “Living Theory,” where they reflect on any “living contradictions” in their work that are causing emotional discomfort. Given that I have been troubled by the climate science emerging over recent years, it was about time I joined them in exploring my own discomfort! As I reflected ahead of the interview, I realised that communicating my experience may be useful for others as they try to integrate the latest depressing climate science into their outlook and plans. I also realised that some of the decisions I have been taking may have been because of not having a community of fellow travellers… and if I want that now, then I should start by getting more honest about what is going of for me right now. So, hello. What follows is a personal story of my journey over almost 4 years since I began to accept the scale of the climate tragedy and what that could mean for my life. This blog does not present the latest science that forms my starting point. For some information on that see here. To summarise, I have come to the view that when contrasting progress on climate action with the latest climate science, it is probable that our civilisation will collapse within the lifetimes of people alive today, and it is possible that humanity will be extinct by the end of the century. Some scientists are concluding a swifter demise than even that! I dont like exclamation marks but that one seemed appropriate. The main reason for this view about collapse and possible extinction is how feedback cycles are heating up the Arctic so fast it will release huge amounts of methane that will then trigger more feedbacks and thus ecosystem collapse, mass starvation and related conflicts. To speak of nearterm collapse and possible human extinction is seen by some people as ridiculous, alarmist, defeatist, irresponsible, or confused. Or all of that. Lots of words are thrown at people who are concluding it’s goodnight humanity. Typically such criticism comes from people who haven’t studied things closely. Or from those who censor this view by claiming it won’t help us to change. My experience has been the opposite. Seriously considering nearterm collapse and possible extinction has triggered major changes in me and others which didn’t lead to paralysis. But I will come back to that later. Here are fourteen recommendations based on what has been helping me, or what, in hindsight, I think could have helped me! Look for opportunities for supported self-reflection and sense-making. This is because your worldview and self identity will undoubtedly transform overtime as you process the new information and analysis. If you are a mission-driven professional in fields related to environment or social justice then expect that you may be driven to rebuild a sense of self worth and that this need of the ego, while natural and potentially useful, could become a frantic distraction. Expect a change in your personal relationships and how you spend your spare time. Some forms of small talk and light-hearted social interaction with acquaintances may seem pointless, while you may wish to spend more time with close friends and family. While for some this could be a welcome rebalancing, for others this can become a vector of reclusiveness and loneliness. Therefore it is important to find new ways of connecting with people on the new levels that feel meaningful to you. Don’t get dogmatic and avoid those who do. That comes from recognising that our terms for phenomena are not the same as the phenomena themselves. The words we use imply things which may have effects on us but aren’t necessarily so. Words like nearterm, civilisation, collapse, and tragedy, are our words, and may trigger ideas, images and emotions which aren’t inevitable consequences of the phenomena being described (more on that “social constructionism” later). Do not prioritise maintaining your own mental and physical situation at the expense of the need to act in solidarity with future generations who will live with the future we are creating for them. Tomorrow’s children won’t thank us much for having joined a support group on facebook or taken up yoga! OK, that ends my summary of recommendations which I have identified based on my experience over the past four years since I woke up to the scale and dimensions of our climate tragedy. The rest of this piece (after the picture) recaps some of that journey that made me conclude with those recommendations. It’s a long read, so now would be a good time to make a cuppa as you appreciate the sunrise over the Aegean from, Kalikalos Retreat. My journey with climate change really took a turn in March 2014. 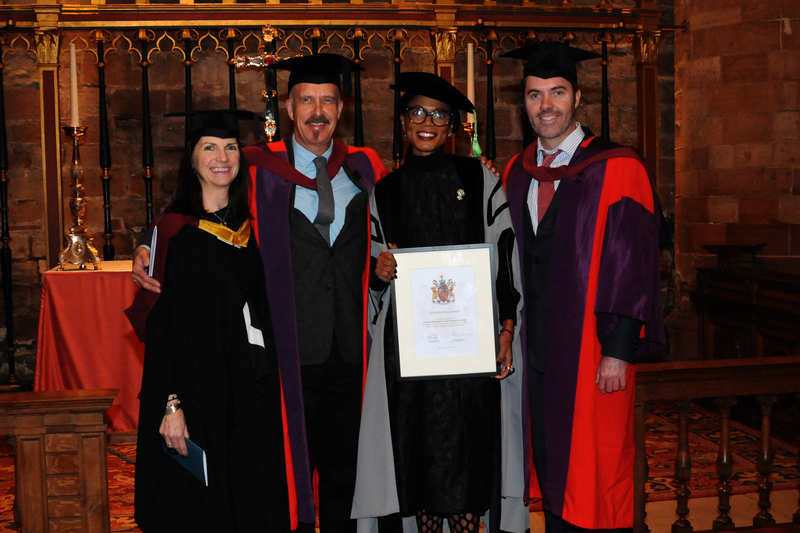 I had just finished delivering my inaugural lecture as a Professor at Cumbria University. I gave the lecture at a Literary Festival and the topic I chose was “the adventure of sustainability”. In preparation for the talk I sought to identify the common theme across my previous 20 years of research, teaching, advocacy and practice. A key theme was how we need to tell new stories about ourselves and society. I described how corporations are the most influential storytellers of our time. That is probably obvious to you, given the role of marketing and advertising. I explained how the influence of corporate storytelling went deeper than that into how we think about what is real or true in fields we might not consider corporate at all. I gave the example of diamond engagement rings, which is a corporate-produced tradition. And I also described how the banking system tells society a story of what is wealth, what life is like and the decisions we have to make in order to get by or succeed. It does that through its creation of our money as credit with interest to those it decides to empower with that new spending power. The speech was offering a “critical social constructionist” viewpoint. I suggested we needed to free ourselves from a dominant worldview to escape to sustainability. By that, I meant that unsustainability is not the result of a lack of ideas and effort, but the result of us being cajoled into certain ideas and efforts that are contrary to the original wealth around us. I framed the challenge as an adventure towards sustainability, because I already realized that the presumed pragmatism of an incremental approach to change, by engaging business and investors, was no longer a credible view. I also used the idea of adventure to reflect how uncertain our future path has become and to reframe the daunting challenge as something to inspire rather than discourage. I didn’t practice my speech much because I was losing my voice with the onset of a flu. And what an awful flu it was, putting me in bed for a week from the day after the lecture. I was to discover just how emotionally powerful giving a speech that summarized and concluded a part of my life would be. In preparing for the speech I had thought it important to remind myself of the bigger context within which I had been working over the previous 20 years. I looked at the latest data on environmental degradation and poverty reduction, amongst other aspects of what we term “sustainable development”. So I knew that despite progress in changing some organizations and attitudes, the data on the big picture was really bad. I wanted my speech to summarize a key theme and truth from my range of professional activities over the previous 20 years. But it also needed to be somewhat relatable – and therefore somewhat acceptable – to my colleagues, wider academia, and the general public who would be paying to be in the audience. So although I had this grave fear I was coming to doubt the very possibility of sustainability I didn’t let myself explore that ahead of my inaugural. Now in bed with a fever, I went back to some of the worrying stuff I had skimmed over during the past weeks. I read about methane. I read blogs, watched videos and then accessed the scientific papers that were being referred to. I learned about the amount of methane in the permafrost and the current rate of release. I learned about the amount of methane frozen in solid form on the Arctic sea floor. I learned about how geologists had concluded that the last mass extinction event which wiped out about 95% of life on Earth was most likely caused by methane release from the Arctic sea floor triggering a rapid warming of the Earth’s atmosphere. The quivering voice and slightly moist eyes of one of the Russian scientists when she was pushed to comment on the implications of ice shrinkage and temperature measurements was a memorable moment for me as I slumped feverish in bed. Perhaps because of an experience of validation and conclusion from my inaugural, as I lay in bed, I was more able to let myself accept not only the probability of a near-term collapse of civilization, but even the possibility of the near-term extinction of the human race. That led me into a multi-dimensional experience of loss and of grief. There is the sadness about the suffering of all people, and of the people you know who are alive today. There is the fear of what will happen, and when, to your own life and to your loved ones. “How much time have we got?” one asks. There is sadness with the suffering and death of all other life forms. There is the trauma of having in one’s mind an imagined future so disturbed from how things look and feel today. I could no longer look at the beautiful landscapes in the Lake District and appreciate them for what they were without imagining what it might look like in 50 to 100 years. Would it be scorched, flooded, uninhabited, polluted? Then there was a sadness, grief and confusion about a loss of my own self worth. Because a key part of my identity was regarding myself as an informed, dedicated and sensible agent of good who sought sustainability. Over the previous decades I had made conscious sacrifices to give my life to that work. Or at least, I had justified a lack of balance in my life and an absence of diverse forms of joy, as a necessary side effect of my commitment to a cause. So suddenly I experienced a wave of regret. This personal loss of self-identity and feelings of regret are something that I now see shaped some of my actions over the 4 years that were to come, in ways I was not fully aware of at the time. I’ll have to come back to that. Another form of loss and grief was of the cultural frame of reference for helping me determine what, from now on, might be right to think and to do. That is because I sensed our contemporary culture was no longer a solid framework from which to develop my ideas. I had difficulty finding people with whom to talk to about what I might think and do next. Related to that was a sense that nothing I could create or contribute to, at any level of physical, intellectual or cultural form, would last for much more than a few decades. As someone who was so focused on communicating ideas, at-scale, this was particularly difficult. Looking back, I realize that I had some kind of faith or insight that there is an ultimate meaning to existence in general, and therefore to mine in particular, and therefore a meaning to my relationships with others. That has become more clear to me as I see how many people appear too fearful of despair to let themselves even consider possibilities that would trigger such despair. In my case, it might be a philosophical hangover from when I was a teenage Christian, who believed that God’s love for us transcends our understanding of it. It could also be because since I had become post-Christian (no, not an official designation), I had read Vedic, Jain and Buddhist philosophies about the nature of reality and the idea that consciousness precedes matter and energy. I had studied some of the latest insights from the Natural Sciences that seriously undermine the view of nature as an unthinking machine of separate parts. In physics we have quantum mechanics which suggests that matter is connected to a universal field no matter where it is. In biology we now not only have epigenetics to show environmental influences on gene expression, and more evidence of group selection. We also have evidence of mutations not being entirely random as they sometimes correlate with parents’ perception of their changing environment. This, coupled with knowledge that there were at least a dozen hominids that evolved from apes but which went extinct rather than evolving into homo sapiens, also made me see how our planet is constantly evolving life forms towards species like our own, as well as all others. I suppose this perspective that there is a divine or spiritual dimension to existence which gives rise to the flow and patterns of life on Earth meant I knew that the end of our culture and the end of our species would not be the end of meaning itself. I describe this worldview with an emphasis on concepts but what has been as key to me is that I have experienced this perspective in states of altered consciousness. The memory of those experiences gave me a life jacket as I slipped into despair. That did not mean I was going to swim through despair that well. Since that time in bed with the flu, I have recognised it as a moment of change for me. But only when Dougald from Dark Mountain asked to interview me did I reflect on what I have been doing over almost 4 years since that moment. I think there is value in analyzing what happened to me and sharing it with others, which is why I am writing it down now. The value has become apparent to me as I’ve witnessed more and more people express their fear that despair leads nowhere. Not so. I have seen despair is not the end. It led to a range of new perspectives and activities for myself and then those I engaged with as a result. Some good, some not so good, some conscious and some not so conscious. Sharing this may help you reflect on what you are going through, or might experience if you ever come to despair. I say that while fully recognizing I am not a trained psychoanalyst of psychotherapist nor am I steeped in any one particular spiritual tradition or methods for its instruction. I still have much to learn. Looking back now I realize that my past few years have been characterized in part by a professional catharsis. By which I mean an effort to express myself professionally in areas and ways that I restrained myself from in the past due to old stories which no longer made sense to me. My previous focus had been on having the most expertise and experience in a particular niche that was concerned with persuading and enabling large organizations to change. In effect, I was offering myself to existing power structures. In the name of being professional in the field of management studies and management consulting I was therefore very careful about how I presented ideas such as transforming capitalism. Now with the idea that this system is dying, the lid came off. My first professional shift was to rework the leadership course I was about to teach into one that was explicitly focused on intellectual and emotional emancipation. The idea was already in the course outline, just as so many leadership courses offer self discovery. But I took it a step further in explicitly exploring the ways that our consciousness is held back by dominant ideas in our society. My idea was that if we arrive at a position of suspicion towards social norms, and connect to timeless wisdom, we will be more robust in taking a new approach to social and environmental issues, on the one hand, and professional development on the other. On the final day of the course I explained how I felt about the latest climate science and how it was currently destroying my sense of self-worth and leading to something else… which I wasn’t sure of, but which the course was part of. The course was one of the most rewarding experiences of my professional life, and some of the students who participated in it became co-travellers in this post-sustainability exploration. Suddenly I felt compelled to write in mainstream publications about mainstream politics. Trimming the edges of capitalism wasn’t enough. I was not going to be silent anymore about politics, and published on topics ranging from issues of security through to economy. Suddenly I was debating the former Lord Admiral of the fleet about Trident renewal and writing columns on Corbynism. This new line of work eventually led me to providing strategic communications advice to the Office of the Leader of the Opposition in the United Kingdom during the first 6 months of 2017. During the General Election campaign I ended up co-writing speeches and other documents. What was the connection to climate tragedy? For me it was clear. To avoid making matters worse as we experience the impacts of climate chaos on the UK directly and through supply chains and financial systems, we need to turn away from the neoliberal value set that leaves everything to market forces and disparages social solidarity through political action. I think we need some emergency socialism. For the first time in my life I was hearing a leader of a political party in the UK speak about how we are proud of our systematic compassion, that we are great because we care for each other. Jeremy Corbyn was bringing these ideas back into the mainstream of public life. Looking back over the few years since my flu-bound revelations I can see how extremely busy I became during a time when I really needed to reflect. The rush of energy from this professional catharsis was also, in retrospect, fueled by the reaction of my ego to my new awareness. I had lost my previous identity and sense of self-worth. Part of my busy-ness may have been a felt need to reconstruct a sense of self-worth. It may also have been a desire for meaningful and consuming distractions from climate tragedy, as I did not know how to live day-to-day with that at the front of my mind. I have focused most of my reflections on professional matters. That is because my sharing on this topic is primarily about how we “work” in relation to it. But the distinction with personal life is not so solid, especially for something so profound as this. Looking at what has changed, I see that my social circle shrank. That can be normal for someone entering their 40s. But in my case, as a single guy with no children, that might not be so normal. I spent more time with closer friends and family. I found it more tiring and pointless to have small talk and thus more difficult to meet new people. Dating apps seemed torture. Instead, I felt drawn to spend more time in nature. I organised my life so I could take time out and live for some months in Bali, Indonesia, finding the beauty of the nature and the culture a balm for my concerns and a suitable backdrop to more philosophical explorations. I realise that I have not shed desires for wealth, status, fun and security, though I now aspire to. The fear of not progressing as I thought I might, or in comparison to others, as I age, still lingers in the background. Looking at that now, I think such factors have influenced my decisions and I feel disappointed about that. Things may change, but for the past few years it hasn’t been easy to discuss this topic casually with either family, friends or colleagues. And as it is such an encompassing issue, this inability to communicate one’s reality can be isolating and diminishing. I limited my explicit exploration of climate tragedy to conversations and correspondence with a handful of people who had come to the same realisation. By mid 2016 I was not happy with myself for keeping this matter to that small group. I had been invited to keynote at a conference of climate academics and policy makers, in Australia. It was a long way to go and I don’t like to fly without a rationale. Another speech about corporate steps towards environmental sustainability felt a depressing idea to me. I was worried about how I would come across, but decided to go for it. I described climate change as a tragedy not a problem that would be fixed, and how we now need to spend as much time on what adaptation would involve, including adaptation to a collapse of civilisation as a result. It does not mean stopping efforts to curb emissions or capture more carbon, but means accepting that immense suffering and loss is going to happen – and soon. It means actively working on how to not make matters worse. I realised that people, like me, might be able to consider this if they had a map or a framework to help them navigate it, and so I offered one as a “deep adaptation agenda”. I was surprised and delighted at the response, with people coming up to me afterwards thanking me for my courage and sharing their reflections and metaphors on the same subject. 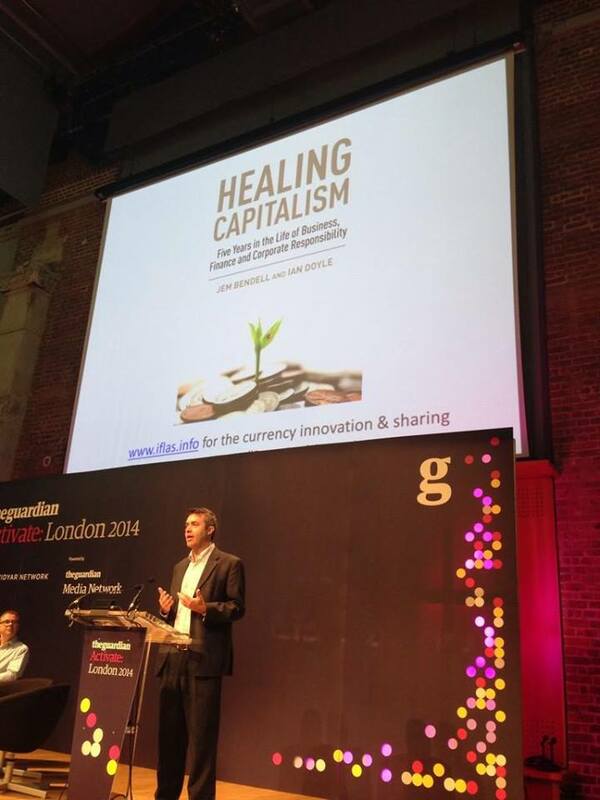 Then a year later I discovered that the concept had been used by funders in the UK for their grantmaking. Discovering that I wasn’t speaking into a void, that in fact there was resonance and people could amplify these ideas, helped me conclude the catharsis. It seems I had roared enough. The last four years were professionally transformative. I am now a political communications trainer and advisor and a leadership trainer and researcher with a consciously emancipatory approach to both. I am a currency innovation consultant with an overt attention to the social and environment implications. I have also now published academic papers in these areas as an academic, so have transitioned that aspect of my work into this new phase. But there has been a professional cost, as I disengaged with a community of research where I had status, expertise and networks, so might have been included in funding bids and special issues of top journals. To help those who respect my past work to consider a more radical approach today, I published a reflection on some of the implications of the useful but limited impact of existing partnerships. I have not yet published anything academic on the “deep adaptation agenda,” in part due to the cathartic rush I have been on with other work. Fortunately, I have begun to find academics in related fields who are explicitly addressing aspects of this agenda, such as Professor Jonathan Gosling in his recent papers on leadership during periods of cultural collapse. He will be keynoting at our next conference on leadership in September in the Lake District. Interbeing is a word describing a conscious experience of being more than our physical body and separate mind. It is another way of describing higher consciousness, so as to emphasise its more embodied form. The idea is fairly well established in non-Abrahamic spiritual traditions, as well as within the more gnostic threads of Abrahamic religions. The idea is that although we experience ourselves as separate due to our senses, consciousness is not limited to our brains or bodies. Rather, it is like a field of magnetism or gravity. Moreover, it may be like a field that is not limited in time and space as magnetism or gravity are, instead encompassing all of existence. From this perspective it can be said that consciousness is having an experience of itself through us. How might interbeing raise you from the threat of depression if you sense the end of everything one can contribute to due to near-term extinction of the human race and the majority of species? Not by making us feel more as one with all humans who will be born to die young. Or more as one with all dogs and cats who will starve to death. Nor by feeling more as one with all the birds in the trees who will die of heat exhaustion. Or more at one with those landscapes we most enjoy seeing and experiencing which will transform out of recognition. Or more as one with the wonderful culture of ideas that we have enjoyed learning and contributing to, but that will vanish into ruins like other lost civilisations. The more we experience interbeing with all these deeply important things, the more we may suffer. An answer may lie in our sense of what there “is” to inter-be with. There are no half measures with interbeing. All is one, as that great phrase explains. I think the answer lies in whether we see that greater consciousness as a source. In particular, does consciousness exist as an original phenomenon that gave rise to matter (and so lies within it, finding new forms through it), or does consciousness arise out of matter (which logically would imply randomly). There is a lot of support in the history of human thought for the former view of consciousness giving rise to matter. Now there is a lot of new scientific evidence for that view, including the latest in evolutionary biology and in quantum physics (which I will summarise elsewhere). If we have the view that consciousness gave rise to and works through matter, then we see how it gave rise to species, all humans and all civilisations. Therefore we are one with the potential for all things. Thich Nhat Hahn has suggested we take time to reflect on the number of civilizations that have collapsed in the past. We could walk around the ruins, or watch a video of someone doing so. Imagine the thousands of lives, with the joys, heartaches, intense discussions, hopes for the future and stories of the past. All so intense at the time and all now gone. Then consider how these civilisations have kept arising again and again in different places and times. There appears to be an underlying impulse towards them. Or let’s go a step further. Take a moment to reflect on the way our planetary ecosystem has kept producing hominids, most of which never evolved into humans but went extinct. They were bipedal large brained animals with opposable thumbs and in many cases the desires to draw and to burn. Therefore, some scientists are beginning to consider whether evolution is entirely random. That doesn’t imply an anthropomorphic God that designs species, but a field of consciousness that gives rise to similar patterns of life. In one ancient tradition this is called the Akashic Record. It means that who we are and what we do now is both influenced by and will influence an eternal record that pervades all time and space. If a collective consciousness is understood and experienced in this way, the pain of the passing of life as-we-know-it may be lessened. Because we are one with the source consciousness that gives rise to all life and will do so again and again. Many people who are troubled by climate change are “environmentalists” and many such people are interested in reconnecting with non human “nature”, as a means of sensing our interbeing. While this can be a useful first step, it may extend the awareness of self only partially in both time and space and could lead to new waves of pain, anger, sadness, distraction, and therefore distorted thinking on what to do now. Therefore, the climate tragedy invites us to see interbeing as all or nothing. You might rightly point out that I am at risk of proposing a worldview because it makes one feel better. This subjective distortion is the root of confirmation bias as well as the flaw of so many religions. “It must be right because it feels wonderful.” I currently have no answer to that problem, apart from that I know in my own life I have not arrived at this perspective quickly as a means of tranquility. Indeed, I think the more I embrace it and bring it into my daily consciousness, the implications may not be so easy after all. The pain associated with an awareness of climate tragedy may be deadened with this perspective on total interbeing, but there remains a question of meaning for our individual lives. Given that our previous ideas of purpose and meaning have been shaken with the awareness of impending collapse, most people would seek a new basis for the meaning of their lives. That is something I will need to spend more time on this year, perhaps always. But I am already wondering whether our meaning can be found within a purpose of approaching this moment with as much awakened connection to universal source consciousness as possible. In that way, contributing to the akashic memory of that source consciousness at an unusual time in existence. I have a feeling that such an approach would involve heightened compassion and wonder. I also sense that the positive “vision” for what we can work towards while accepting a coming collapse will be about communities that nurture that compassion and wonder. But it is something I need to reflect on and discuss some more. The perspective I have just expressed assumes some “free will” within us. Or to put it another way, some ability for original phenomena to be created by us, within us, to then add back to the source consciousness. How is it possible for there to be any agency in a part of a whole if all is one? How would we know if our view that we have free will isn’t actually determined for us? We don’t. But if we didn’t have free will to exist in ways that create novel input into the akashic record, then what is the consciousness within individual organic lifeforms for? Perhaps nothing. Or perhaps simply to express the intention of the whole. And that is what I have to conclude at this time: I do not know if there is any individual agency. Nevertheless, the implication is that to approach life from from a heightened connection to source consciousness will more likely align with the purpose of source consciousness, if there is one. Now is when we begin to speculate. It appears that source consciousness tends to diversify the complexity of matter. It appears it creates sentient beings who wish to avoid pain and experience pleasure. It appears that the process of unfolding complexity leads to new forms of reflective consciousness. Therefore, I could choose a purpose to reduce suffering, promote joy, enable reflection, and unleash emergence. This does not sound so different from the great wisdom traditions, as well as the common sense knowledge of most people I know, if not deluded by obsessions over race, nation, politics, status, wealth or religious correctness. I am currently in Ubud, Bali, which attracts many spiritual seekers from around the world. It is a Hindu island, with an animist flavour, and many religiously observant families. Many of the foreigners participate in what some would call “new age” spiritual practices, such as shamanic breathwork or cacao ceremonies. Despite that, I have not yet discussed any of what I have written above with the people I meet here. Because I have often felt lonelier with people who are overtly on a spiritual path. When I hear of their focus on positive thinking, visioning, and being in touch with one’s body and emotions, I wonder if this is naive and self-serving. Yet the effect is nice enough and I don’t want to upset them. It is a cliche that some of the people with the most needs and fears gravitate to either religious devotion or new age spirituality. I do not think the worldview I have described in my writing today is an immediately self-serving one. It would be far easier to dismiss climate tragedy as hype and block it out as one does a warrior pose while breathing incense. I am discovering, therefore, that I may need to be proactive if I want to be part of a community of “spiritual” people, approaching life in full awareness of the climate tragedy. From the amount I write, you may have noticed that I’m an academic. Though you also may have noticed I am not limited to one discipline or a narrow concept of validity for knowledge claims. I see logical positivism as a tool not a totality. Mostly I’m a sociologist, and before wrapping up these reflections, I’d like to share a realisation that critical social theory could be essential for developing equanimity in the face of the climate tragedy. Social constructionism is a philosophy that recognizes that the words we use to describe phenomena are not synonymous with the phenomena themselves. Because the phenomena themselves are simply phenomena and our experience of them is simply experience. We label phenomena with words in order to communicate about them, but that does not mean that they exist only in the way that our words describe them. Social constructionism helps us to be aware of how we are applying the lens of our language to reality, in ways emphasise certain patterns and not others. Social constructionism does not deny that there is a reality but that such reality is prior to our interpretation of it. Critical social constructionism goes a step further in questioning how certain terms or “constructions” sustain certain power relations in human society, and are themselves the result of such power relations. So by “critical” we do not mean negativity or questioning. Instead, it reflects an emancipatory interest in the application of social constructionism. “Spiritual critical social constructionism” is a label I wish to offer for the importance of our exploration of how concepts used for the “spiritual” or the “ineffable” or the “divine” or the “metaphysical” or the “Godly”, are not synonymous with the phenomena being described. That also goes for any terms that relate to such matters – whether in religious or somewhat “new age” communities of discourse. The astute reader will see how this begins to sound very similar to the central teaching of Lao Tsu, who opened his book with “the truth that can be told is not the truth”. You might think he would pack up with his book writing ruse there and then. But with that caveat he then delivers a massive book. Because although words are limited tools, they are darn useful. As I hope you are finding right now. The social constructionist perspective reminds us that when we speak of “probable near-term collapse of civilization” that each of those words mean different things to different people and, more importantly, are not synonymous with the realities they are helping us to consider. Words like nearterm, civilisation, collapse, and tragedy, are our words, and may trigger ideas, images and emotions which aren’t inevitable. In this field, like in any other, we must be vigilant against any new dogmas emerging. Being without a partner or children, it may have been easier for me than most to take the time to explore the issues I’ve described in this piece. I realise that for many people it is tough to change the focus of one’s career or the situation at home in light of new information, simply because modern life is so jam packed with activities, responsibilities and the need to earn a living. So I see the need to support people with the process I went through. Therefore, I am trialling a “deep adaptation retreat” later this year, where participants who have reached or gone through despair over the climate tragedy will explore together how we reconstitute meaning and sustain ourselves. The retreat is also a response to my realisation I need a form of philosophical community around the perspectives and processes I’ve described above. It starts by sharing more. So I have begun writing up my reflections and sharing them. This writing is also going to be key sensemaking so I more consciously choose what to do next. I will stick mostly to personal reflections, rather than extensive academic-style research. At this stage I don’t know how my participation in a philosophical community on this topic will develop. To help connect with people exploring what this path means for their professional work, I have created a Deep Adaptation group on LinkedIn. If you aren’t on that platform, then please join my mailing list as a way to keep updated. If you are organising activities on these matters, please let me know (or post to the LinkedIn group). And please tell your networks about the retreat. It is possible that Dark Mountain may grow into the philosophical community I think is needed. Whatever happens, I’ll always be grateful that they kept this topic alive over the past decade, and then prompted me to reflect in this way. Dougald’s take on the interview with me, as well as an audio, will be appearing on their site soon. My thanks to Katie Carr, Cam Webb, Susan Holden, Marc Lopatin, Charles Eisenstein, Jonathan Gosling, Dougald Hine, Georgia Wingfield-Hayes, Chris Erskine and Jonathan Leighton for correspondence and conversations along the way as I’ve pieced these ideas together, as well the facilitators of spiritual practices at Yogabarn and The Ark, Ubud. Thanks to Matthew Slater for showing me what dedication to one’s contrarian truth looks like. When discussing the sorry state of efforts to address climate change with professionals working on this topic, across sectors, I often hear a reluctance to question whether it is too late to avert catastrophic climate change, or what such a view might mean for the focus of our work. Various objections to this view are raised and prevent open discussion or an evolution of work. Therefore, I decided to deliver a speech at a leading climate business and finance event in Australia, at Griffith University, to seek feedback on my argument that we must now shift focus. There has been some progress on environmental issues in past decades, from reducing pollution, to habitat preservation, to waste management. Much valiant effort has been made to reduce carbon emissions over the last twenty years. There have been many steps forward on climate and carbon management, from awareness, to policies, to innovations. Larger and quicker steps must be taken and can be now that there is COP21 and major Chinese engagement on the issue. To support the maintenance and scaling of these efforts is essential. Small steps have been taken on adaptation to climate changes, such as flood defences and planning laws. Yet these steps on climate mitigation and adaptation are like walking up a landslide. If the landslide had not already begun, then quicker and bigger steps would get us to the top of where we want to be. But the latest climate data, emissions data and data on the spread of carbon-intensive lifestyles tell us that the landslide has already begun. If the world does not keep further anthropogenic emissions below a total of 1,300 billion tonnes of carbon, we won’t keep average temperatures below that 2 degrees warming. If we are not already on the path to dramatic reductions we will not keep within this limit. We are not on such a path, with emissions still at around 40 million tonnes of CO2 a year and the decoupling of growth from emissions minimal. The uncertainties on the edge of scientific consensus do not suggest a respite, with some increased carbon sequestration through increased vegetation not as significant as the methane emissions not factored into most models, and where Arctic warming is already progressing beyond even the most extreme predictions. Therefore, we are set for disruptive and uncontrollable levels of climate change, bringing starvation, destruction, migration, disease and war. The implication is that we need to expand our climate work into a deep adaptation agenda, including resilience, relinquishment and restoration while learning why this tragedy is occurring. I will explain more about that deep adaptation agenda in a moment. I realise that at this point the reader, or listener, might feeling a bit affronted, disturbed, or saddened. In the past few years, many people have said to me that “it can’t be too late to stop climate change, because if it was, how would we find the energy to keep on striving for change?” With such views, a possible reality is denied to permit a continued striving which has its rationale, therefore, not in serving the expressed goal but in maintaining self-identities related to espoused values. This form of denial is different from outright climate denial, but is also unhelpful, as John Foster argues well in his book After Sustainability (2015). It is emotionally difficult at first, but we need to move beyond that pretence if we are to remain relevant. In doing so, we open ourselves up to discuss a ‘deep adaptation’ agenda as well as exploring why this tragedy has begun and why we have been so poor at responding effectively. I will make some brief comments on these topics before concluding with some thoughts on how we evolve our research accordingly. A deep adaptation agenda will involve increasing resilience, relinquishment and restoration Resilience involves people and communities better coping with disruptions. Examples include how river catchments can better cope with rains, or how buildings can better cope with floods. What I’m calling relinquishment, involves people and communities letting go of certain assets, behaviours and beliefs where retaining them could make matters worse. Examples include withdrawing from coastlines or giving up expectations for certain types of consumption. Restoration involves people and communities rediscovering attitudes and approaches to life and organisation that the hydrocarbon-fuelled civilisation eroded. Examples include re-wilding landscapes so they provide more ecological benefits and require less management, or increased community-level productivity and support. There will be increasing discussion about what is to be learned from the tragedy of climate change, and honest inquiry existing alongside strategic attempts at framing disruption, degradation and loss to maintain one’s relative power in society. Disruption, degradation and collapse will be framed by different people as a resulting from foreigners, capitalism, industrialism, individualism, consumerism, patriarchy, anthropomorphism, secularism, liberalism, progressivism, and atomism (where we see things as separate). We are even seeing framing of disruption by religious fundamentalists, who, to my knowledge, don’t discuss climate but seek to respond to the disruption it has already caused. One study by Columbia University argues that in Syria, the worst drought in 100s of years, made worse by climate change, led to 1.5 million people being displaced from their lives in rural areas and increased food prices in cities. Some radical Islamists were able to thrive in this situation with their explanations of cause and solution, replacement stories of personal identity and purpose, and offers of sustenance. My own analysis is that the West’s response as restricted by the dominance of neoliberal economics since the 1970s. That led to hyper-individualist, market fundamentalist, incremental and atomistic approaches. By hyper-individualist, I mean a focus on individual action as consumers, switching light bulbs or buying sustainable furniture, rather than promoting political action as engaged citizens. By market fundamentalist, I mean a focus on market mechanisms like the complex, costly and largely useless carbon cap and trade systems, rather than exploring what more government intervention could achieve. By incremental, I mean a focus on celebrating small steps forward such as a company publishing a sustainability report, rather than strategies designed for a speed and scale of change suggested by the science. By atomistic, I mean a focus on seeing climate action as a separate issue from the governance of markets, finance and banking, rather than exploring what kind of economic system could permit or enable sustainability. Given this context, while the new Sustainable Development Goals (SDGs) and the culture they reflect are helpful for non-climate related matters, given the systemic nature of the impacts of global warming, they may be ill-focused. Instead “minimum survival goals” would be more appropriate, to reduce the rate of increase in starvation, destruction, migration, disease and war. We don’t need consensus on that, but a shift right now from those who have a professional income, skill set and network to work on matters broadly related to climate change and its effects. As the point of no return can’t be fully known until after the event, ambitious work on reducing carbon must increase. But a new front of work on deep adaptation is as important today. Understandable emotional traumas from realising the tragedy that is coming, and in many ways upon us already, shouldn’t prevent us from exploring what this probable reality could mean for our choices now. Moreover, from social psychology, there is some evidence to suggest that by focusing on impacts now, it makes climate change more proximate, which increases support for mitigation. In my talk at Griffith I explore more about the nature and future of leadership in light of this assessment of the climate tragedy. More on the event is here. UPDATE: Until June 1st 2018 I am receiving PhD applications on the topic of deep adaptation, connected to either organisational studies, policy or sociological disciplines, for starting Oct 1st 2018. Either based in Cumbria or remote working, full time or part time. There are no scholarships for these. Fees information from http://www.cumbria.ac.uk If you have a masters degree and are interested in this topic and self fund, then please drop me a note. Me (slightly pissed human): Why do you say “but”? Why not “so”? This was a very educated lady, works at a top University. My reflection is that once narratives of blame are maintained by mass media then a spirit of wanting to connect to people living in societies with such narratives can then lead us to find complementary narratives to the power structure that those main narratives of blame protect. We all peck the smaller bird.